Yesterday I arrived in sunny Los Angeles for a 4 day mini-vacation. I wanted to share with you what I wore on my flight because it can be challenging to find a good comfortable airport outfit idea. As someone who travels a lot I have become a pro at finding outfits for the airplane, but this might be my most comfortable airport outfit ideas to date. So of course I had to share it with you; along with my new luggage which I am beyond obsessed with. When I came across this “airplane mode” sweater on Etsy I knew I had to snag it. What I didn’t know was that in addition to being a cute graphic sweater, it would also be so comfortable! It is both super lightweight and made from the softest fleece material. I went with white as I tend to go with light colors when I travel, but it also comes in both black and grey. 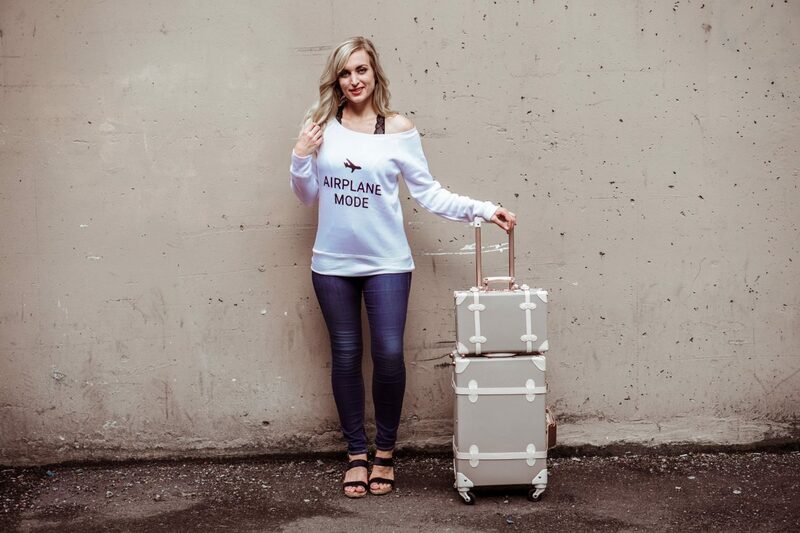 I mean really, how can you beat a sweater that says “Airplane Mode” for a flight?! Cutest comfortable airport outfit idea ever. On to this luggage set! I have a ton of luggage that I have acquired over years and years (seriously I think I have 8 suitcases in my storage locker in Vancouver. eek.) But because I have aquired it all in a piecemeal fashion, there are no matching sets. I knew I wanted to get a matching set this year but have held off to find the right one. I found this vintage luggage set and ordered it almost immediately. This is the carry on and handbag size carry on, but there is also a larger checked bag version; I just didn’t take it with me on this short LA trip. 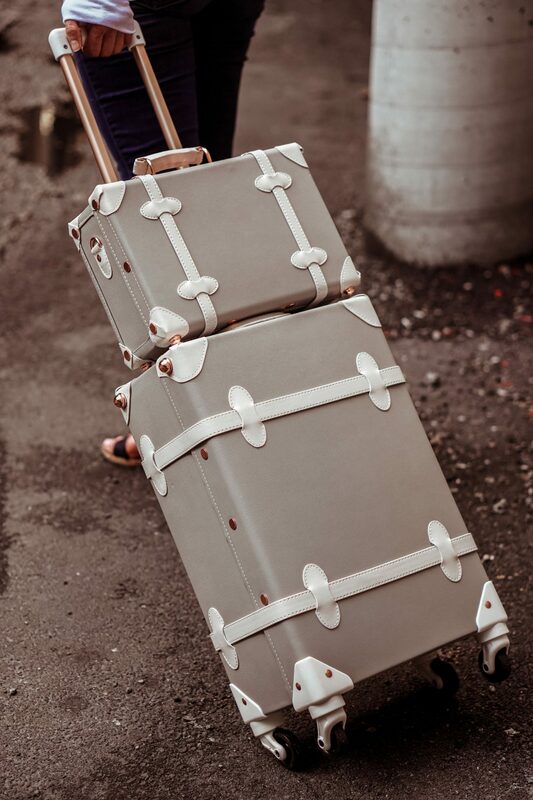 The luggage is the prettiest shade of dove grey with white accents and rose gold hardware. The rose gold hardware is what sold me on this set; it is even more beautiful in person! You also can’t see it in these photos but the luggage is lined in a soft pink material which is a really pretty touch. As far as the rest of my outfit, I went with my most comfortable jeans & some wedges. First; the jeans. Seriously, if you have never tried this denim you NEED to. These jeans honestly feel like butter. They are by far the most comfortable jeans I own. So there you have it; my comfortable airport outfit idea. And now I’m going to get back to exploring LA! If you want to see what I am up to be sure to follow me on instagram – I share all about my trip in my instastories! "The Wear to Work Dress of Summer 2018"
"Fitting Room Reviews | Work Wear | Nordstrom Anniversary Sale"
Have fun in LA girl! Really loving this travel style! Such a cute jumper! That sweatshirt is too cute! And I have similar luggage except mine is lilac 😉 Have so much fun! Thanks Lizzie! And ooo that sounds GORGEOUS! Love lilac. I definitely need that sweatshirt. Super chic and comfy look. Thank you!! It’s so fun right! This luggage is amazing!! I have been in the market for some new travel pieces and LOVE these!! Thanks Ashley! I was unsure how the quality would be, but am 95% happy. In my opinion the outside is really good quality/well made hardware which I was pleasantly surprised about. The inside lining on the mini-carry on though is sort of ‘peeling up’ at the one corner, so I’m not thrilled about that, but overall definitely a great set. Your luggage set is so cute!! Loving that sweatshirt too! 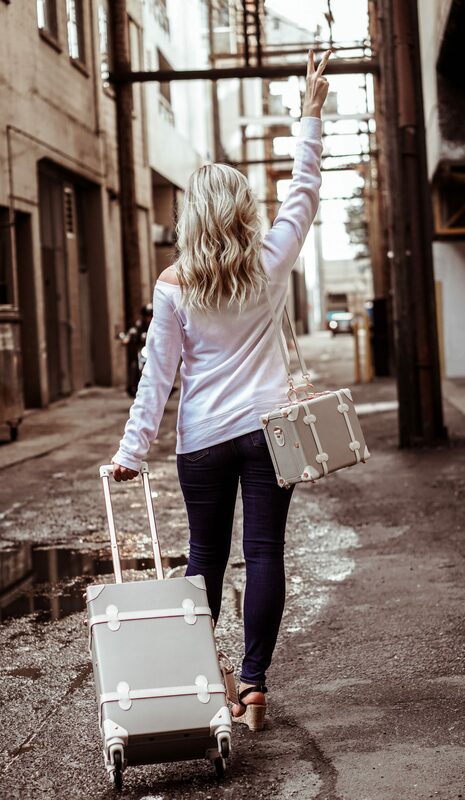 This luggage is so fabulous and chic! And I love your cozy and cute flying outfit! Your roller bags are so chic! I love the style of them. You look adorable for traveling on the airplane! Such a cute travel look! 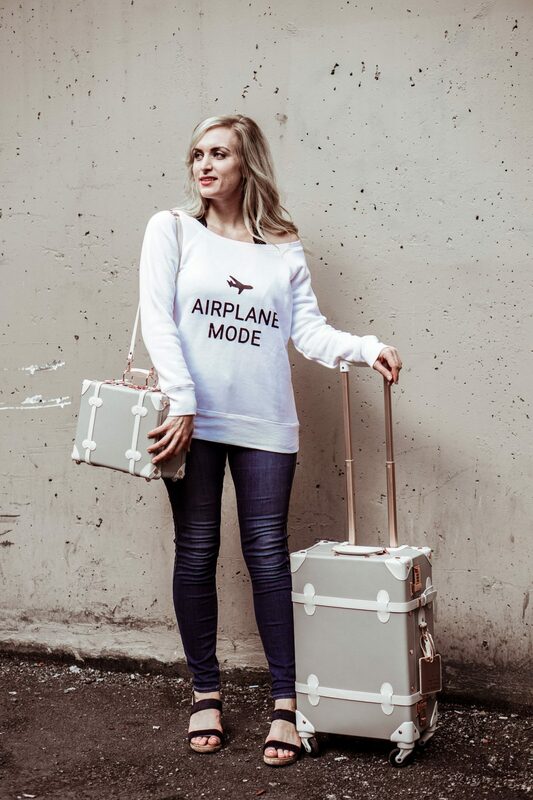 This sweater is too cute girl and I am loving your luggage! I love this luggage set. Enjoy your 4 days in LA so much to do and see. Thanks Megan! I’m having a blast – definitely wish I could stay longer! 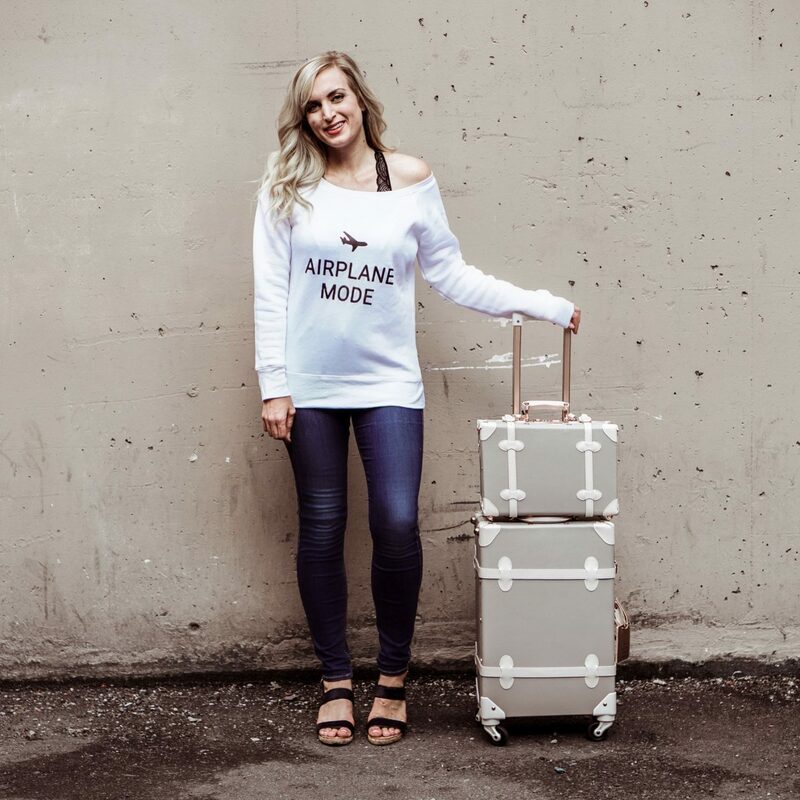 Love your cute & cozy airplane outfit! Also that luggage is adorable!